When Lisa published her challenge I was both super excited and intimidated. She has hosted other challenges before and every single one was amazing so I knew this one was going to be no exception. Deboning a chicken has been on my list of techniques to learn for quite some time but that was deboning chicken cutlets without turning them into shreds! Deboning a whole chicken was taking things into a whole new level! Before you start, remember to keep a clean area! Make sure everything is washed thoroughly before proceeding. After you’ve boned out the chicken – wash and sterilize everything – from the table to the cutting board, towels, knives etc. Finally, save the carcass and bones to make stock! 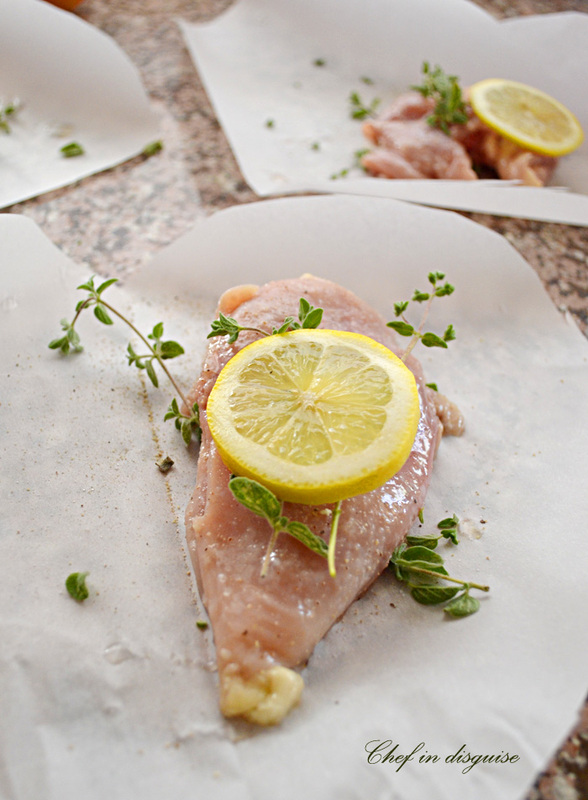 Freeze in a freezer bag if you’re not going to make stock immediately – up to 1 year. One more tip from Lisa:When you watch the video you will realized that you will have to rewind each step several times. Considering that you’ll be watching it online…I recommend placing your laptop or Ipad, or whatever you use, on the table you’re doing the deboning. Wrap your laptop keyboard and touch pad with cling film.When you need to rewind, wrap your fingers/hand in a clean towel to do so. You can wash your hands every time you need to rewind, but trust me, unless you already have experience boning out a whole chicken, it can get tedious because you may be rewinding a lot! One year ago:The Daring Cooks’ April 2012 Challenge – Create Your Own Recipe! Freekeh filling (see recipes below). 2 Lay the chicken skin side down on the work surface and sprinkle with the salt and pepper. Spread the cool stuffing evenly over the chicken – stuffing the legs too.Roll the chicken up, tie it with kitchen string, and place it in a roasting pan. 5 Lift it from the pan and place it on a platter. 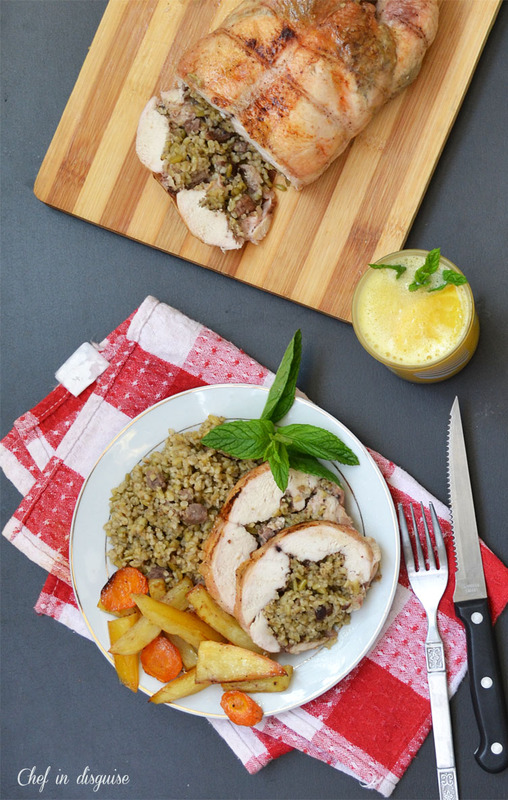 You can read more about freekeh and how to prepare it here. I used the same recipe except for adding the beef, you brown the beef first then proceed with the recipe in the exact same way in the link. 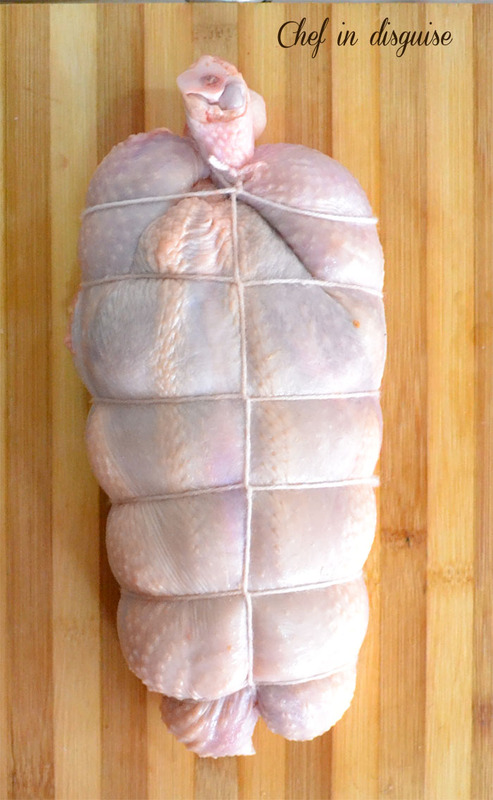 Posted in Chicken, Daring cooks, How to and tagged chicken ballotine, daring cooks, How to debone a whole chicken, jacques pepin, Middle eastern ingredients. Bookmark the permalink. this really looks good Sawsan.. although I wonder whether I have the skill to be so neat!! love the colour on the skin.. its such a beautiful presentation dish!! G’day! First if all, CONGRATS on accomplishing deboning, TRUE! Now that I have completed the challenge, I KNOW how challenging it can be too! Beautiful job with the deboning! JP’s instructional for the process is the absolute best. And something new – although I’ll experiment with off grains, I’ve never seen freekeh… I’ll have to keep an eye out for it. I keep planning to do a whole boneless chicken stuffed with pistachios, but I never seem to get around to it. I have to see you photos are so professionals and I’m so glad that the family liked the result so much. And yes I agree ballotine chicken is a whole level above normal roast chicken. Cheers from Audax in Sydney Australia. This does sound like an amazing challenge Sawsan. Your final product looks amazing! I’ve not heard of this technique before but I have to say I love it for a few reasons: the result and that you get a whole other meal out of one chicken! Your tip to wrap the technology in film wrap is fantastic! 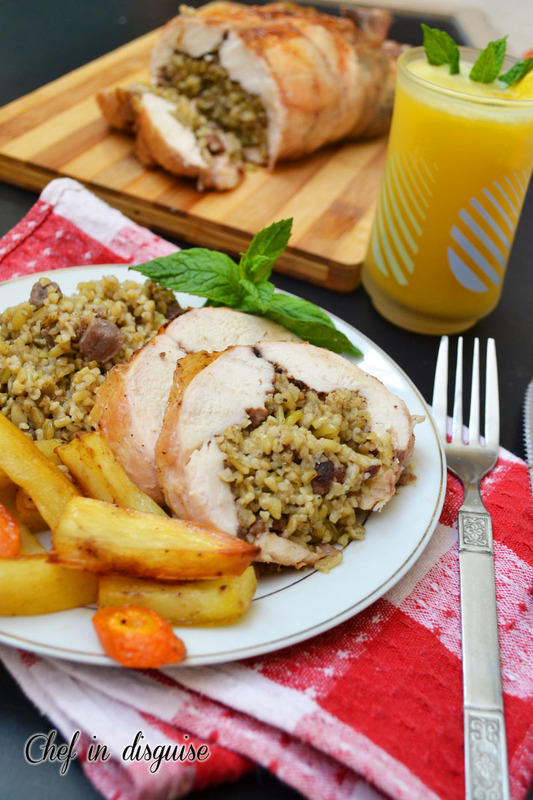 I’m glad you didn’t “chicken out” – and thanks for sharing the freekeh stuffing, it sounds delicious! We only recently discovered this grain, and really like it – I’m sure it tastes great with the cardamom-allspice flavored chicken. Beautiful job of tying it up, too! An amazing challenge indeed. And of course, Pepin makes it look easy because he’s done hundreds over his life. 🙂 The easiest part for me was the removing of the ligament from the filet as I’ve done it with whole chicken breasts many times. 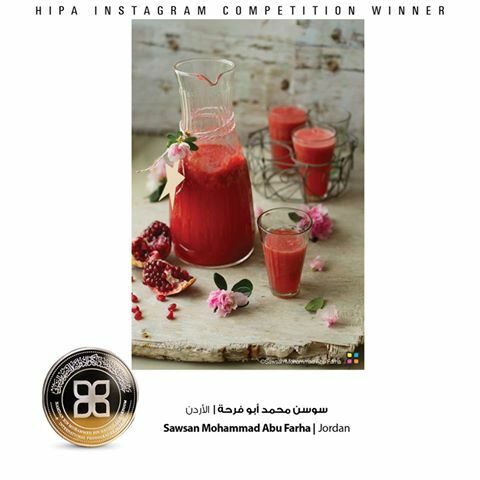 Congratulations on the beautiful result. Congrats! I’ve never boned out a whole chicken from the inside (I’ve done the body cavity but not the legs – but this is something I really should do someday. Great recipe and exceptionally fun post. Thanks. You have inspired me to try it and with freekeh, I will not blame your son, it looks so delicious, and good to know how to debone the bird. Thanks Sawsan. This looks so good – the stuffing in particularly has me drooling! Great job – and so perfectly executed and beautifully photographed as always! What a delicious stuffed chicken! Impressive! This looks fantastic! I think I would be very intimidated to do something like this! Great job! What an amazing skill and a lovely result. I must admit, I’d rather the butcher did it and he will do it right in front of me if I ask him to, for no extra cost. But I don’t get your sense of accomplishment though. I stand by in admiration and clap loudly enough for you to hear right across Australia and an awful lot of Asia 🙂 ! 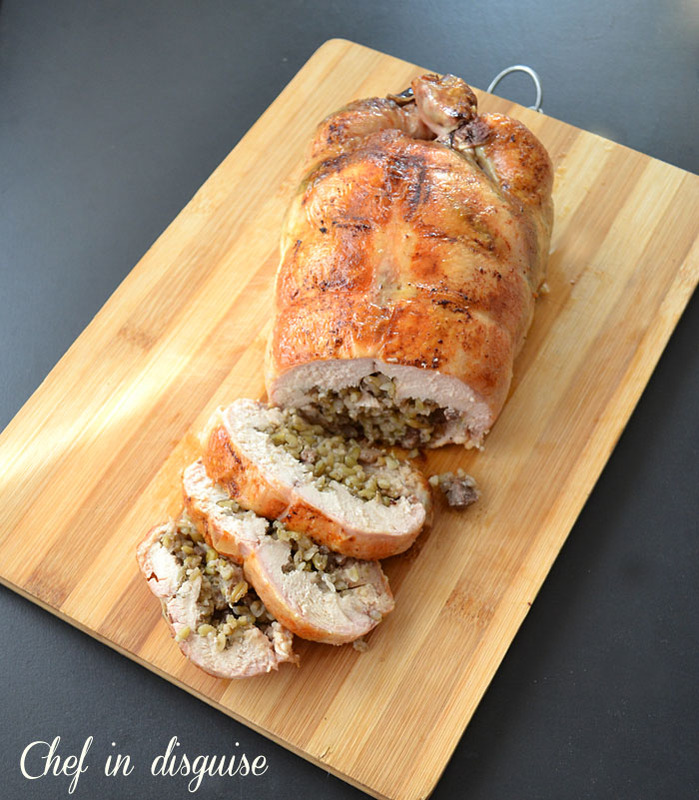 I love chicken ballotine but have yet had the time or patience to debone the blessed thing! And that freekeh filling just has to find a place in my kitchen!! Huge fun and a wonderful lesson! Sawsan – your ballotine is beautiful! Freekeh is a great filling choice. I am drooling over the Freekeh filling. What a beautiful bird, the color is so perfect. I was a bit intimidated by the process before I started but what a great technique. Wonderful job and lovely photos! Hi Sawsan, sorry for taking so long to visit your Ballotine, life just got in the way this weekend. Thank you for your lovely comment. You outdid yourself as well, I think that not even Jacques Pepin’s Ballotine looked that neat and perfect. I totally agree with you, from now on a roast chicken will never be the same 🙂 I had to research freekeh, I had never heard about it, so one more lesson learned from you! It looks absolutely delicious! Hello Renata, please don’t appologize. I know how crazy life can get. Great job on deboning and stuffing chicken, I had this on my to do list as well for a while, your post really inspired me to try. One of my fav recipes is Murg Mussalam – Indian stuffed whole chicken roasted in tandoor. I love all kinds of stuffed chicken, and this one looks special, truly daring. I wish I could eat off that plate. Your pictures are a work of art. Sawsan, it looks amazing. Since I’m only with my partner at home, I’ll wait for a good ocasion or a dinner with friends to make it. Thank you for the challenge. Mine wasn’t QUITE as pretty, but it turned out well. I have some questions for you (if you’re free to answer of course :).. In some restaurants here in Jordan, the freekeh is very green in color! I’ve never managed to find a green one in stores here in Amman.. do you think that they use food coloring to make it look green? or are they using real fresh freekeh? Sometimes I find “Egyptian freekeh” on the shelves. 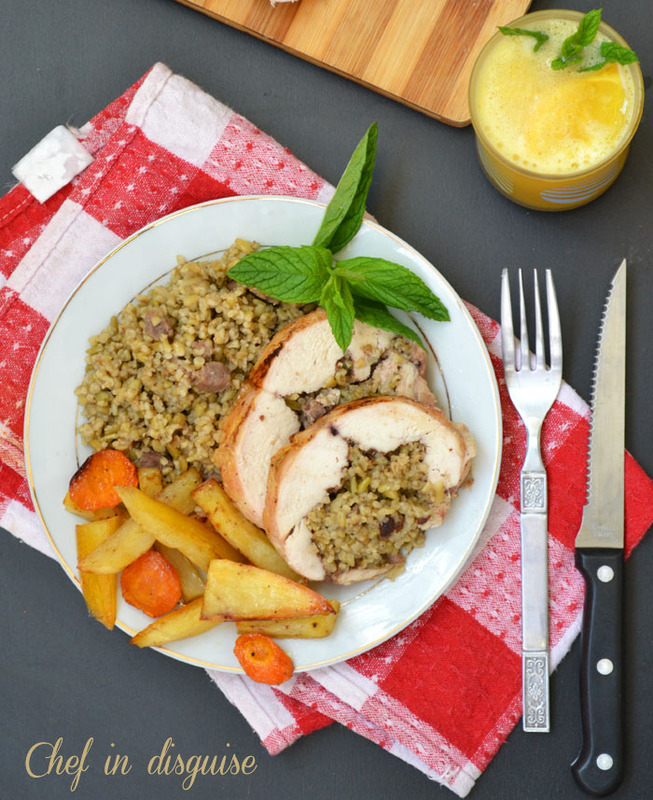 What’s the difference between the Egyptian freekeh and the common coarse freekeh? Just had an idea to use the left over chicken carcass to make a stock in which I will boil the freekeh. What do you think? Regarding the freekeh, when it is in season, you can buy fresh freekeh, it is softer and greener than the dried version and I have to add , the flavor is more intensely smoky. The problem is that is only available for a couple of weeks. I use homemade chicken stock for my freekeh whenever I can, it adds so much depth to the flavor, I think you’ll love it! !